BUILD THE DREAM HOME YOU ALWAYS WANTED! What does the house of your dreams look like? Would you rather have a huge bedroom with an elegant canopy bed or a spacious living room big enough for a grand piano? In Dream Home, you design your own custom home from scratch. Your creative vision drives every decision, from the type of roof to the style of interior decor. But make sure you keep up with the Jonses. At the end of the game, the nicest home on the block will be the envy of the neighbourhood. 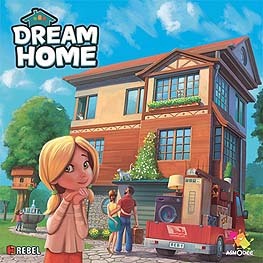 Score points based on your design - the nicest home wins!